For the Katsu sauce, heat the oil in a sauce pan over a medium heat. Add onion, ginger and garlic and sauté for 2-3 minutes. Add curry powder, stir until fragrant, then stir in the flour and cook until sandy. Gradually whisk in the stock until smooth. Add in the soy sauce, honey and simmer, whisking occasionally for about 8-10 minutes. Stir in the vinegar and keep warm. Heat oil in a frying pan to 160 C. Combine the almond meal, coconut and sesame seeds in a tray. Coat the chicken in the egg wash, drain any excess and place into the almond mixture. Coat the chicken all over and gently place into the oil and cook for 2-3 minutes each side. Remove and place onto kitchen towel. Mix the cabbage, zucchini & dressing in a bowl. To serve, place the cauliflower `rice` and cabbage salad onto serving plates. 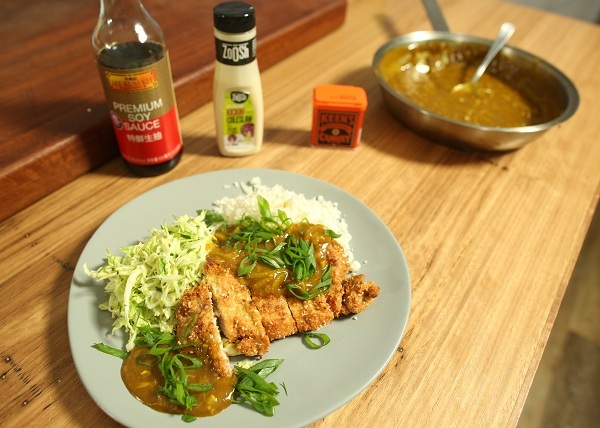 Top with the chicken, drizzle over the katsu sauce and garnish with spring onions.